Apply coupon code 20100314B15P15 to your order at the time of checkout, and you'll get 15% off of your purchase of $15.00 or more. This coupon expires March 14th, 2010 at 11:59pm (CST) Renderosity system time, so take advantage of these sweet savings today. 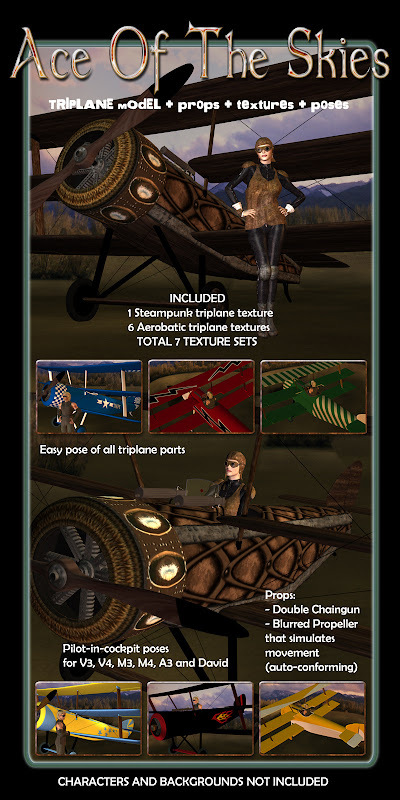 If you didn't got it, for aviation model lovers for Poser and DAZ Studio, I cannot do anything to stop you from getting my model Ace Of The Skies, only for $15.15 with a 15% Off, only through day 16. Added to the 15% Off you get 30% Off, so it is $12 for you.